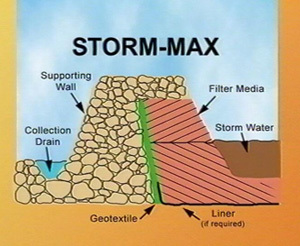 Storm-Max is an innovative storm water filter designed to treat the high volume peak loads required to treat natural run-off. Performance results for removal of Phosphorous, Nitrogen and Heavy Metals are extremely high compared to results achievable using any other tested method. The Storm Max system is flexible in design and has many applications. It is the proven design flexibility of the Storm Max concept that provides a real solution to nutrient and heavy metal export.